4. Rescued Christmas for someone I don't know. 5. Photographed dogs in funny hats. 6. Collected ingredients and containers. 7. Processed a whole bunch of photos of a whole bunch of people and stuff. 8. Learned how to make a brick of sugar into granulated sugar. 12. Watched a movie . 14. Watched a TV show . Got a tree and partially decorated it. Saw Peter Pan (at PCPA) with family members. Slept (but not enough, never nearly enough). Worked, shopped (unsuccessfully), went to work's staff party, church, more shopping (gas in car, even! )slept, read. Pretty quiet around here. Poor Eddie..he looks a bit embarrassed. At least you don't do that daily! baked. and baked. and baked. and went out to dinner with the manhalf and a dear friend. and baked more. my legs and back hurt, but i feel accomplished. Ineed another day. Sunday was spent baking bread for the salon christmas party. Then the party. Today has been spent recovering from said party. I just woke up from a 3 hour nap and damn. I just want dinner and more sleep. I did zero laundry. I did watch the Dexter Finale. Sheesh. so...I need another day. Man, you guys got a lot done! Gail, that's actually not Eddie. He was being corralled by Kath and I couldn't go near him or he freaked out. That's Seven. I used to live a couple doors down from Seven's family when his predecessor, Five, was alive. 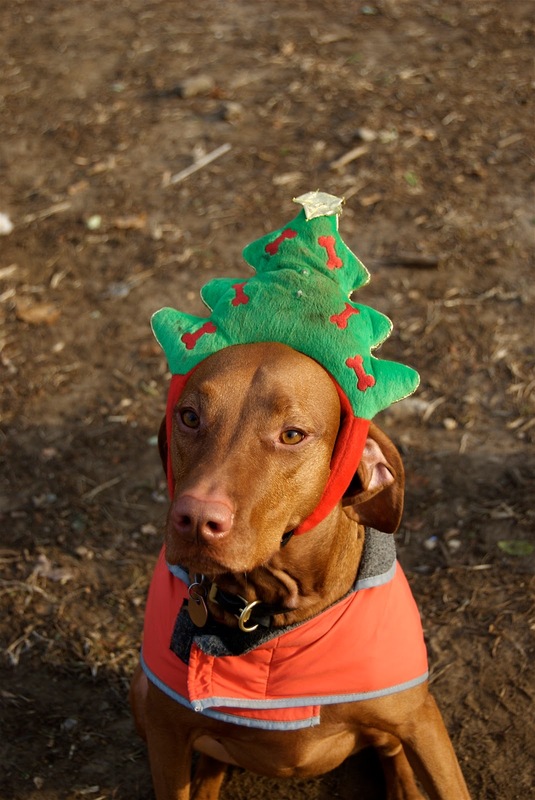 Somewhere in the PUPS archives is a picture of Five wearing the same tree hat. He was, I believe, similarly nonplussed.